By Road From the Chichester by-pass (A27), take the A286 following signs for the Witterings. At the Stockbridge Roundabout take the second exit - A286 signposted Bracklesham, Witterings. After two miles turn right into Chichester Marina. By Train Chichester Railway Station is situated 4 miles from the Marina and direct trains run regularly between London Victoria and Chichester (National Rail Enquiries 08457 484950; www.nationalrail.co.uk). By Bus Stagecoach Southdown operates a service every twenty minutes between Chichester Bus Station (South Street) and the Witterings (service no. 52/53). See www.stagecoachbus.com for timetables and further information. 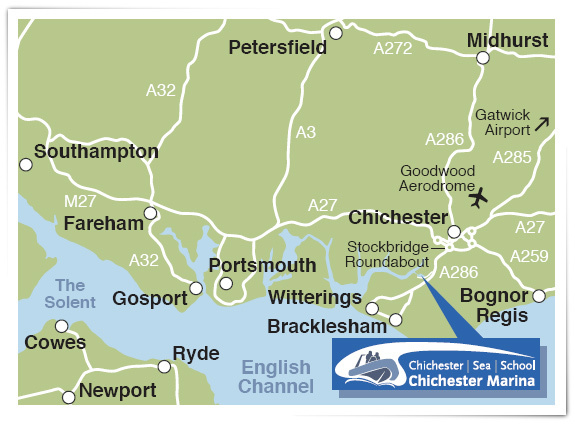 By Air Gatwick Airport is situated 52 miles from Chichester; there's a direct train service between the airport and Chichester Railway Station. Private aircraft may land at Goodwood Aerodrome, telephone 01243 755066 for prior permission. The airfield is 5 miles away from the Marina.